A hundred years ago this week… Verdun stopped. Quite a moment, though it’s only the French who date it as August 31, while German accounts said September 2 or 9 and more recent overviews suggest December – probably such datings tend to the arbitrary in attritional warfare where the front lines move very little and the fighting continues over months before and after the Generals make their declarations one way or another. Estimated casualties for Verdun (commonly regarded as a stalemate): by a 2006 estimate, 373,231 French and 373,882 German. On the Western Front, the Allies prospered – at further terrible cost. The British Army finally won the Battle Of Delville Wood (July 15-September 3), beat back German attacks at High Wood (September 1), and instigated the successful Battle Of Guillemont (3-6), while the French Army took Le Forest and Cléry-sur-Somme (3). Although the Russian war effort is often written of as creaking by this stage, they made progress around Lutsk, Halicz, Lemburg and Volhynia (August 31-September1, all in present Ukraine), while also backing up the Romanian attack on Austria. In the Battle Of Transylvania (August 27-November 26), the Romanian Army had a misleadingly good first week, taking Kronstadt, Petrozseny and Hermannstadt, but by September 2 the German and Bulgarian Armies had begun to strike back at the Battle Of Tortucaia. And down in German East Africa, the British continued their relatively untroubled conquest of the massive territory (most of current Rwanda, Burundi and Tanzania), a key moment being the surrender of casptial city Dar-es-Salaam to the British Navy (September 3). One tried to maintain a pride in one’s appearance. I anticipated that now, being louse-free, I might be able to continue in that enviable state for a few days, but the odds were against me – reinfestation inevitable. I knew from experience. I would lie down in some place previously inhabited by one of my lousy pals, bound to pick up a few of the little devils who had deserted him for reasons unknown. When we arrived at Boulogne, the two Sergeants – such merry companions on my journeys to and from Blighty – had to leave me and right sorry I was to see them go. Before they left their respective Battalions, they had been told where they should rejoin it. I had no such instructions. You may recall in what haste I had been obliged to leave, asleep near the front line one moment, the next starting off on that most joyous journey. From Boulogne, I was directed to make my way to our Divisional Headquarters*, picking up such transport as I could find. On arrival at HQ, I was told to spend the night there and proceed next morning to the village in which my Battalion was now resting. After a couple of lifts from Army lorries, the final kilometres I had to manage on foot. But this provided me with a most warming experience as I strolled into the town. Our lads, who had themselves arrived only a few hours earlier**, were billeted in dwellings and outbuildings at various points along the main street. Groups of them lay about on the wide grass verges on either side of the roadway and, at intervals as I walked, fellows who knew me invited me to join them and each in turn insisted I took a swig from their water bottles – all charged with the same liquor, to wit, cider. I was greatly surprised, first, that so many people knew me and, second, that they should offer me a drink. Their kindness warmed and enlivened me just as much as the rather strong cider. Millencourt-en-Ponthieu (see footnote): June, 2016, just before #Somme100 – my wife Gaylee walking down the lane where my father Sam was greeted by his comrades in August 1916 when he returned from him leave to find the Battalion enjoying a few days' rest from the Somme front line. The insistence of one chap in particular that I should drink with him certainly startled me, though I was careful to conceal it. 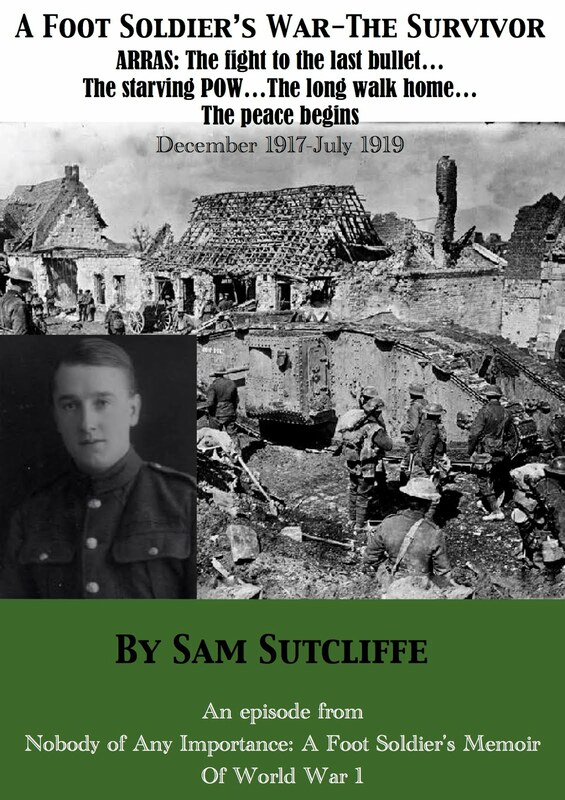 I’d known him from time to time since the beginning of the war – a short chap, head rather big considering his lack of height, bright blue eyes in a usually red face. 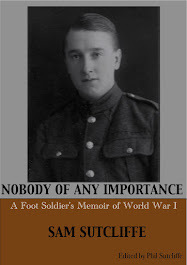 He’d joined a different Royal Fusiliers Company, but circumstances occasionally brought us together. However, I’d never felt happy or secure in his company. Sometimes, if you attempted to share a joke with him, the thing would go wrong, he’d see some personal adverse implication in it***. For no reason that I could see, the red face would go redder, the eyes would glare and he’d be all set for a scrap. I hadn’t chatted with him for some time, and I had not known until that moment that he, along with some others, had been transferred to my present Battalion. Maybe he felt somewhat of a stranger in this new set-up so even my face was welcome. He certainly insisted I should share cider with him. * Oddly, I can’t find any source that pins down where the 56th Division’s HQ was. But some references suggest Hallencourt, a village about 16 kilometres south of Abbeville, in the Picardy region of the Somme department. ** This must have been Millencourt-en-Ponthieu, 63 kilometres west of Hébuterne, in the Picardy region. The Kensingtons’ War Diary says the Battalion left the Hébuterne area of the Somme Front on August 19, stayed overnight and bathed at Bayencourt, then marched to Halloy (16.7 kilometres northeast) and stayed another night (acquiring some specialist reinforcements while there). On the 21st they marched on to Doullens (7.5 kilometres west) where they caught a train to Saint-Riquier (35 kilometres west; spelt with a hyphen by most sources but, as you see below, not on the town’s own war memorial which, of course, may well know best). They marched to Millencourt that night (5 kilometres northwest). So my father, arriving “a few hours” after them in daylight must have got there on August 23 – probably via a lift to Abbeville, then another 9 kilometres east to Saint-Riquier, concluding with a solo hike to Millencourt (remembering that he had to carry most of his equipment, including his rifle, home to London with him, a weight of about 60 pounds). Saint-Riquier's memorial to their own World War 1 dead, pictured in June, 2016. 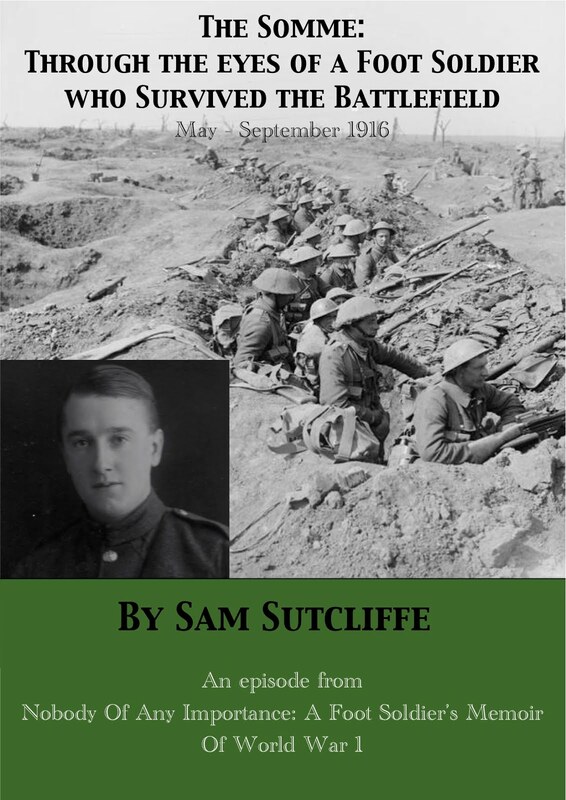 *** Looking back to my father’s account of joining up with the 2/1st Royal Fusiliers in September, 1914 (see the Memoir or Blog 18, November 9, 2014) I reckon this sounds like “Sticky” Pryke, “the Soho wide-boy, outgiving with his rich Cockney humour, but quick to take offence”. Sam discovers Lloyd George himself sorted out his first home leave since Christmas, 1914! And he meets a girl… But then the War summons him again… twice, as it happens. On the Western Front, after the bloody “success” of Pozières, the British Army launched another attack on Delville Wood in the south of the Somme region (August 21). They used the newly devised “creeping barrage” stratagem, the infantry advancing a short distance behind a line of shelling – the “friendly fire” hazards obvious and terrible. But they combined with the French to take the wood and moved on towards Flers and Thiepval, while other British Battalions advanced on Bazentin-le-Petit (25) and the French won Maurepas and beat off a counterattack (24). The Russian Army’s extraordinarily extended forces still rode a wave of success taking the heights south of the Jablonica Pass, Ukraine (August 22), sending help to the Romanians at the start of The Battle Of Transylvania (27, the same day they declared war on Austria-Hungary), and advancing against the Turkish Army in Armenia again (22 west of Lake Van, 23 at Rayat, 23-4 to retake Bitlis and Mush). The Allies’ Salonica campaign began to make headway with the French and British progressing in Moglena, Macedonia (August 22), and the exiled but regrouped Serbian Army defeating their invaders, the Bulgarians, near Kukuruz (24) and Vetremik (27). And down in vast German East Africa – currently Burundi, Rwanda and Tanzania – the British continued their unending advance by taking Kilosa (August 22), Miali (24) and Morogoro (26). Last week, my father suddenly found himself issued with the home leave pass he’d longed for, and described a journey from the ravaged countryside of the Somme to the natural, green loveliness of England as viewed from the Dover-to-Victoria train. Out of hell and back to Blighty he experienced nothing but kindness – from a bus driver giving him his fare home because he had no money to the welcome of parents and siblings. Love, laughter, a bed with clean sheets, a comprehensive delousing by his mother… heaven. 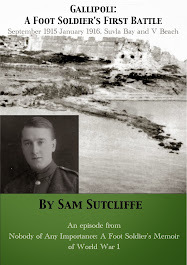 ‘My mother, father and I talked for quite a long time that first evening and, although we had sent each other letters at fairly regular intervals, I had to fill in many gaps because Army censorship rules meant I couldn’t name places, with the exception of Malta. Meanwhile, many things had happened locally to people we knew or knew of and these matters they related to me. But the shock that shook really hit me when Pa almost casually told me that, as I’d requested, he did write to Lloyd George about my having been denied leave after reaching France from the Mediterranean, and how unfortunate he thought that was, particularly because, having served well enough to be promoted to the rank of Corporal, I was still below the permitted age for young men to go on active service. The whole thing seemed unbelievable, yet it had happened; my quiet, self-effacing father involved in such an affair and myself the beneficiary of a wonderful kindness emanating from Downing Street*. I lay awake, marvelling at the turn of events. Elation and a resolve to make the most of every minute of every day of that holiday from the war front, starting with the easy pleasure generated by just resting in that clean, sweet bed. Ma lent me money for the fare to the West End office where my pass, pay-book and a letter from our adjutant procured me a few pounds. Prices remained low in spite of the war and I was, temporarily, very nicely fixed. Apart from any personal outings I had in mind, I booked seats in the stalls at two music halls for my parents and myself – at one show, I took a seat for my younger brother as well. I felt sure I should encounter no Military Police while I confined myself to the area of my suburb, so I took certain little liberties with my dress, such as wearing a pair of smart slacks I’d bought which were not the precise khaki colour of the regulation trousers; carefully creased, worn without puttees and with shoes instead of heavy boots. Out walking I carried a stick I’d bought about three years earlier at a great exhibition at Earls Court — made by natives called, I believe, Igorotti Indians**, it was covered with symbols burnt into it while I waited. Puzzled glances from passing people were just what I had hoped for, and I felt the soft Army cap, pulled well down over my left ear, added the final distinctive touch. Had I met a military cop, or perhaps an officer, no doubt I would have received another sort of touch — on the shoulder. Hours at home, walks around the old, familiar places, the two shows — everything great, freedom unlimited was mine. Until I came face to face with a girl I’d known slightly at the church. How she’d grown… in a little over two years, visibly expanded in all the approved places. She had the then fashionable method of using the eyes; you looked directly at her, but she appeared to be focussed on a point just above your head. Very effective, especially if the eyes were a brilliant blue. We walked and talked, I self-consciously, she being the first girl I had been alone with back in London, even in the street. On a free night I took her to the pictures, to a really go-ahead place where, to add music to the silent films, you didn’t have just a pianist but a small orchestra. Tea and French pastries afterwards — already well on the way to the Devil. With another meeting arranged I felt compelled to tell my mother about the girl, the renewed acquaintance, and see the disappointed look on her face — my short remaining time at home must now be spread around more thinly. I really regretted this, although excited about having such an attractive girlfriend. Life had become quite a heady, dazzling affair. Plenty of cash, all the hours of the day and part of the night at my disposal… no one to give me orders, no Jerry to sling shells at me. As the precious break neared its conclusion, I felt a sadness which I threw off by reminding myself that some time still remained. I took a final walk with the girl, part of it in open country… seemingly unconnected to that horrible war. Suddenly, on that dark moonless night, criss-crossing searchlights illuminated the whole sky, wide beams terminating in big, circular blobs of light where they encountered clouds. This unwelcome display of London’s air-raid defences coming into action brought my thoughts back to reality with a jerk. No enemy planes appeared and no anti-aircraft guns fired, but my feeling of security, one of the boons of this holiday, now vanished. No place, after all, completely without risk of enemy attack in some form. We two walked to her home, lingered outside awhile, kissed and parted with promises to write to each other. Next morning, goodbye to younger brother, sister Ciss*** and the baby girl. My parents came with me to the railway terminus. I left them for a moment, hurried to the big clock and met the two Sergeants, who I found in a state of great excitement for reasons they cautiously told me about. They had already checked the platform from which our train should depart. There they heard a railway official tell a soldier that it had been cancelled, that he must go to Charing Cross to board another train in about an hour’s time. The Sergeants hurried away from the platform and, between them, concocted a plot which they hoped would gain us another day at home: simply, that we should hide outside Victoria until it would be too late for us to reach Charing Cross in time to catch the special train. We would then dash into Victoria Station, hurry to the Transport Officer’s place, and report ready to catch the pre-arranged train. I went back to my parents and told them of the wicked plan. We said goodbye in case things went wrong. Strangely, that extension of leave had an unnatural feeling around it. All concerned had thought my departure certain, we’d said our goodbyes, yet here I was, back home again. It didn’t seem right somehow. * The “Downing Street” reference here is a mistake. Lloyd George served as PM for many years, but didn’t move up from Secretary Of State For War until December 7, 1916, after Herbert Asquith’s resignation. ** No doubt the Igorots were referred to as “Indians”at the exhibition, but they hailed from the Philippines. The Tagalog word means “mountain people”. Although, in the 16th century, they held off Spanish colonialists who wanted their gold, in the 20th a group of them fell into the grip of showmen and toured exhibitions such as the 1904 World’s Fair where they reconstructed a “native” village - and T.S. Eliot wrote a short story about them, titled The Man Who Was King. *** Ciss: his older sister, always known as “Ciss”, proper name Dorothy, born December 3, 1894 (for details on Sam’s other surviving siblings – three died by 1912 – see the footnote to last week’s blog). **** Working out the dates by reference to the Kensingtons’ War Diary and the time of the Battalion’s arrival for a rest period at a village called Millencourt-en-Pothieu (63 kilometres west of the front line at Hébuterne), I think my father left home on the morning of August 21 or 22, 1916 – that is, during the 100-years-ago week of this blog, but I decided to hold the journey over until next week as it represents the start of a new “chapter” in Sam’s experience of the Somme battle (and to even out the distribution of his material; he wasn’t thinking in blog-sized chunks when he wrote his Memoir! ).